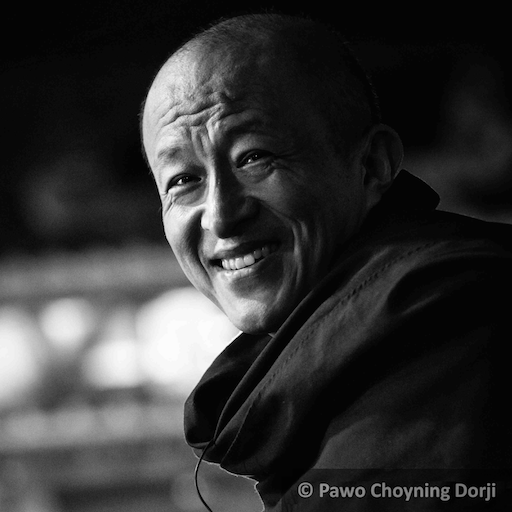 The present Dzongsar Jamyang Khyentse Rinpoche, Thubten Chökyi Gyamtso, was born in 1961 in eastern Bhutan. He was recognized as a tulku by H.H. Sakya Trizin, and received empowerments and teachings from many of the greatest masters of Tibetan Buddhism, including H.H. the 16th Karmapa; H.H. Dudjom Rinpoche and Lama Sonam Zangpo (his paternal and maternal grandfathers); Chatral Rinpoche; Nyoshul Khen Rinpoche, Khenpo Appey, and many others. His root guru was Dilgo Khyentse Rinpoche, who began training Rinpoche from the age of 7. While still a teenager, Rinpoche built a small retreat center in Ghezing, Sikkim and soon began traveling and teaching around the world. In the 1980s, he began the restoration of Dzongsar Monastery in Derge, the responsibility of which he had inherited from his previous incarnation, Jamyang Khyentse Chökyi Lodrö. He established Dzongsar Institute in Bir, India, (now DKCLI in Chauntra), which has grown to be one of the most respected institutions for advanced dialectical study. He also oversees two monasteries in Bhutan and has established dharma centres in Australia, Europe, North America, and Asia. He has written several books and made award-winning films. Rinpoche continuously travels all over the world, practicing and teaching the Dharma. Rinpoche has taught Chandrakirti's Madhyamakavatara five times: in Vancouver (1995), Dordogne, France (1996-2000), Taiwan (1996-2000), San Francisco (2003-2006) and Australia (2005-2008). He has also given many teachings on the Heart Sutra, the Vajracchedika Sutra, and how to apply the Madhyamaka view in practice and everyday life. Siddhartha's Intent was founded in 1989 by Dzongsar Jamyang Khyentse Rinpoche. It is an international Buddhist association of non-profit nationally registered societies and charities, with the principal intention of preserving the Buddhist teachings, as well as increasing an awareness and understanding of the Buddha's teachings. The website has Rinpoche's teaching schedule and downloads of teachings. Khyentse Foundation is a nonprofit organization founded in 2001 by Dzongsar Khyentse Rinpoche to support all traditions of Buddhist study and practice. Khyentse Foundation activities include major text preservation and translation projects, support for traditional monastic colleges in Asia, a worldwide scholarship and awards program, and academic development of Buddhist studies in major universities. Other biographies of Dzongsar Khyentse Rinpoche may be found on Siddhartha's Intent, wikipedia and rigpawiki. 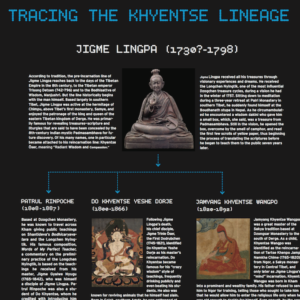 An illustrated version of the Khyentse Lineage from Jigme Lingpa to the present day may be downloaded from ➜Tricycle [PDF]. Source: Biography of Rinpoche is from Khyentse Foundation.